Former Ohio State University football coach John Cooper took time for photos and autographs before Thursday evening’s Meigs County Chamber of Commerce Gala where he served as the keynote speaker. Cooper, center, is pictured with Meigs Chamber of Commerce President John Hoback (left) and State Rep. Jay Edwards (right) before the dinner at the Middleport Church of Christ Family Life Center. Coverage of the Gala, including awards presented, will appear in the Sunday Times-Sentinel. https://www.mydailytribune.com/wp-content/uploads/sites/42/2017/11/web1_11.3-Chamber2017112205724137.jpgFormer Ohio State University football coach John Cooper took time for photos and autographs before Thursday evening’s Meigs County Chamber of Commerce Gala where he served as the keynote speaker. 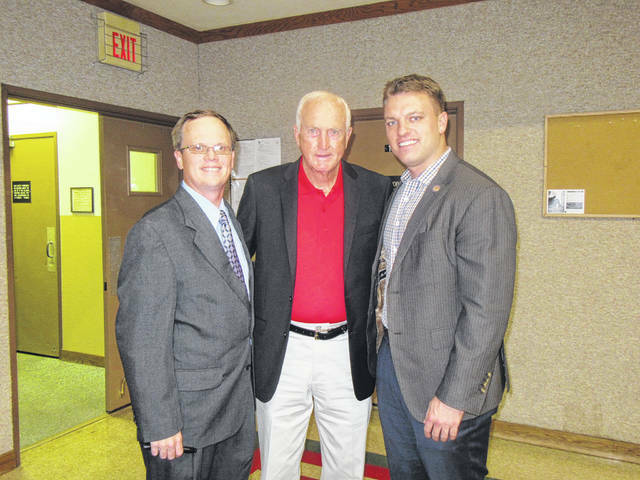 Cooper, center, is pictured with Meigs Chamber of Commerce President John Hoback (left) and State Rep. Jay Edwards (right) before the dinner at the Middleport Church of Christ Family Life Center. Coverage of the Gala, including awards presented, will appear in the Sunday Times-Sentinel.